In the 1970s the Bangladeshis throughout the UK, particularly in the East End of London, became victims of intolerable racist attacks by the Nazi 'National Front' organisation and associated vicious racist skinhead groups. The first generation Bangladeshis in the UK were incapable of defending themselves, primarily because they were peace-loving and believed that they were no match for the racist thugs. They also felt that by taking direct action they would make the situation worse. Many were of the opinion that they had come to the UK to work and would then return to their country. They naturally looked to the authorities to take action to stop such racist attacks. However, they found that the authorities always turned a blind eye to the problem. Because of this attitude, the Bangladeshis suffered as silent victims of racist attacks. Every Sunday, Brick Lane attracted the anti-racist groups and individuals from all over London to fight the National Front. As a result Brick Lane became a battlefield. Some Bangladeshis thought of leaving the UK for the safety of their lives. However, when Altab Ali, a young Bangladeshi, was brutally murdered by the racists on 4th May 1978, there was a sea-change in the attitude of the Bangladeshi community. Bangladeshis vowed to stop racist attacks. Men, women, old and young, all took to the street and adopted the slogans: "Enough is Enough", "Here to Stay – Here to Fight" and "Come Whatever May, We are Here to Stay". 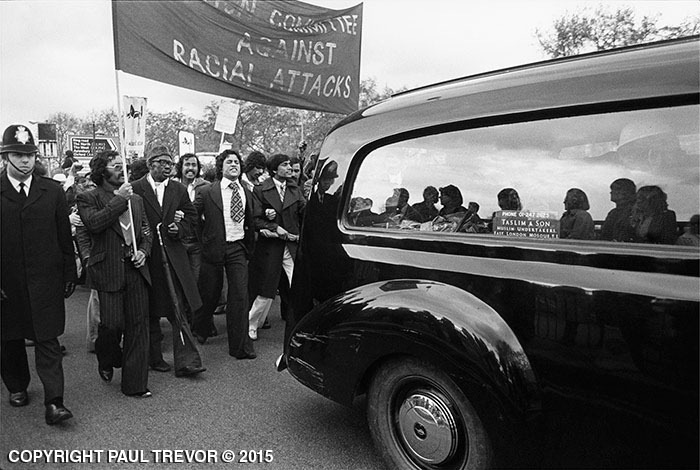 The community was so determined to stop racist attacks that they organised a National Demonstration to protest against racist attacks on them. The murder of Altab Ali made the Bangladeshi community determined to win the battle of Brick Lane. It is very important that we commemorate Altab Ali Day on 4th May each year. As philosopher, George Santayanna famously said: "Those who cannot remember the past are condemned to repeat it". It is very important that we re-visit our struggle in the 1970s by commemorating Altab Ali Day. Such events create collective solidarity and unity. They are an opportunity for us to come together in a common purpose and to create emotional identification with the community. Remembering our past makes an important contribution to our sense of community. It is because of Altab Ali that the Bangladeshi community was inspired to unite and fight back the racists. Because of Altab Ali we have been able to establish ourselves in the UK by securing dignity and respect. It is so pleasing to notice that today the Bangladeshi community is doing surprisingly better in all walks of life. In education, business, politics and media, we prosper as other communities in the UK. However, it is sadly noticeable that from time to time we forget the most important lesson that the murder of Altab Ali taught us: that without unity we cannot achieve anything. Just remembering Altab Ali once a year on 4th May is not enough; we must remember this lesson 365 days of the year. Jamal Hasan was a leading anti-racist activist in East London during the 1970s. He was the General Secretary of the Action Committee Against Racial Attacks which organised the National Demonstration following the murder of Altab Ali.